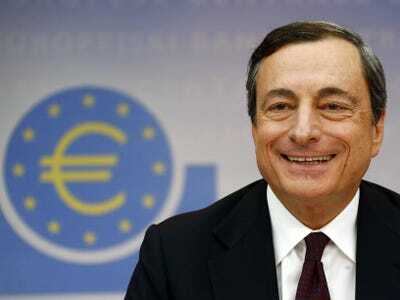 The European Central Bank’s latest meeting concluded Thursday, with no change in interest rates. Mario Draghi is now giving an introductory statement and answering questions from journalists. Here’s the link for the video. Draghi’s language about raising the ECB’s balance sheet back to 2012 levels is still in place. That’s roughly dovish: we now know that some other senior ECB figures weren’t happy when he made that goal public. The fact that the balance sheet goal is in Draghi’s introductory statement means it’s been signed off by the governing council, suggesting everyone is more on board was previously thought. Draghi just confirmed that the “2012 levels” for the balance sheet means March 2012, when the balance sheet sat at about €3 trillion, and implying a €1 trillion increase from now. He’s added some concrete detail to the goal, which was easy to interpret in different ways previously. He also says officials are unanimous in pushing for more stimulus if it’s needed. Staff at the ECB have been asked to prepare for further easing. The euro is falling, down by 0.62%. It’s dipping below $US1.24 for the first time since 2012. Draghi made some mixed points about QE, when asked what the ECB had learned from other central banks. He said it was normal for policymakers to disagree. “There is no drawing line between north and south. There is no coalition” – Draghi now talking openly about rumours of a regional split on whether to ease further. When asked what potential tools the ECB could use, Draghi said “if it’s not monetary financing (directly buying bonds from governments), it’s in our mandate.” That’s leaving a lot of room for action. In September, the ECB announced a bundle of new policies, including purchases of covered bonds (which have barely started), so most analysts were not expecting any big decisions at this meeting. They anticipated that the bank would leave its benchmark interest rate at 0.05%. Meanwhile, there have been several leaks from the ECB in the last month (see here and here), suggesting that personal relationships between Draghi and the other national governors, particularly Germany’s Jens Weidmann, have deteriorated. Questions about the leaks will probably come up during the press conference at 1.30 p.m. GMT. And while we’re waiting, here’s all the important news that’s broken about European economic conditions and the inside workings of the ECB since the last time the governing council met. Refresh this page for live updates.